BEIRUT- Sweeteners added to the liquid nicotine vaporized in e-cigarettes may release levels of certain toxins that are as high as in smoke from traditional cigarettes, a recent study suggests. Many sweetened e-cigarettes list ingredients such as sugar, caramel and honey in the liquid nicotine, researchers note in the journal Tobacco Control. And breaking down such sugars with heat can produce two toxic substances that are also found in tobacco smoke. For the current study, researchers examined fumes released by e-cigarette liquids with different concentrations of three types of sugars, testing the vapor for levels of two toxins known as furans: 5-hydroxymethylfurfural (HMF) and furfural (FA), which have been linked to an increased risk of respiratory tract damage in humans and tumors in mice. In lab tests, e-cigarette fumes sometimes released levels of furans that were similar to traditional cigarettes, if not higher, the study found. 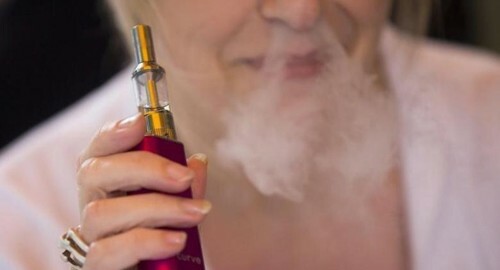 “Furans might be produced when sugar is added to the (liquid nicotine),” said senior study author Najat Saliba, a chemistry researcher at the American University of Beirut in Lebanon. “There are a lot of questions about toxicity that are still unanswered and so the question whether electronic cigarette is safer than tobacco cigarette remains open awaiting more investigations and findings,” Saliba added by email. One factor complicating safety assessments of e-cigarettes is the incredible variety of devices, liquids and nicotine concentrations available, Saliba noted. Users can also mix their own liquids for e-cigarettes, and they can often control the power and duration of puffs for the devices. “Hence, toxicity might be directly related to the smoker’s behavior and choices,” Saliba said. In lab tests prior to vaping, none of the liquids showed detectable quantities of furans, the study found. Lower battery power was associated with higher levels of HMF, while more power was linked to greater concentrations of FA in the fumes, the study found. Two of the sweeteners in the tested liquids – sucrose and glucose – generally had higher concentrations of furans than unflavored liquids. Levels of these toxins with the third sweetener tested, sorbitol, appeared similar to unflavored alternatives, however. Glucose, sorbitol and sucrose aren’t common ingredients in e-cigarettes and they often aren’t used in concentrations high enough to release toxic levels of furans, said Dr. Riccardo Polosa, a researcher at the University of Catania in Italy who wasn’t involved in the study. The cancer risk of furans isn’t established for humans, Polosa noted by email. “Obviously, e-cigarettes are not risk free, but there is a tendency to exaggerate potential health risks with little or no consideration for the emerging health benefits of these products,” Polosa said. Some previous research, for example, suggests that e-cigarettes may help current smokers cut back or quit. Still, sweeteners that are approved by U.S. regulators as food additives might not be safe when inhaled in e-cigarette fumes, noted Maciej Goniewicz, a researcher at Roswell Park Cancer Institute in Buffalo, New York, who wasn’t involved in the study.